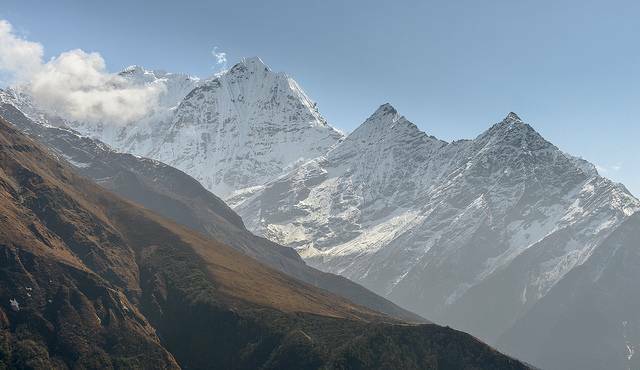 Sagarmatha National Park - The name if pin down, falls to two words. First of which is 'sagar', that literally meaning sky, and then 'matha' which means head. Falling in the Asia-pacific region and being governed by the immaculate Mount Everest, is the Sagarmatha National Park. It is a natural park which is situated in the Himalayas of the eastern Nepal. The reserve is majorly known for the species of bird it has, and is marked as a protected area. The site is a common ground for innumerable flocks of splendid birds which either pit stop after migration from a different region, while some live here and take it as a natural habitat. Sagarmatha National Park is a roughly 1148 km per square of area. As soon as it was established in 1976, tourism didn't follow quite soon. It was the early 2000's that the park was the common talk of some tourists. What adds to the glory of this park is the honor of being listed as a world heritage site, by team UESCO. The park proudly bears a habitat to mammals too. To list a few they include red panda, langurs, musk deer, snow leopards and many more. Another shot at the beautiful reserve, is the hospitality of the common folk popularly called as 'sherpa'. The most genuine and welcoming kind for the travelers and sight watchers. The breathtaking valleys, enthralling steep cuts and the location of it, with the company of such people making you understand the beautiful park and making you feel at home while you lay eyes on some amazing creatures, is downright making this trip a life time experience for you. Lodges with basic food are available in village like Namche Bazaar, Pheriche, Lobuche & Thyangboche & along most common trekking routes. Medical facilities are available at Himalayan Rescue Association (HRA), Pheriche & they also accepts credit cards.